Formatted email news delivered from your website! 4. Archived in YOUR website! Are your best customers thinking of you? Notify them. Inform them of your latest accomplishments using attractive email news bulletins complete with pictures and linked documents. Notifier™ makes it easy. Build custom formatted e-bulletins and e-newsletters with pictures and attachments that remain linked on our server. This makes your email message small – able to be delivered to any email box. Newsletters and Bulletins can be automatically archived in your website, adding a page of content every time you notify. Visitors to your website can self-subscribe by simply providing an email address, which will drop into your Contact Registry for future email campaigns. 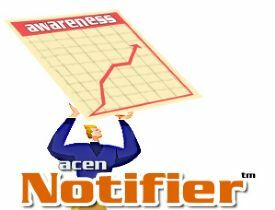 ACEN “Success Stories” are created using by Notifier™ in our website.